You'll find plenty of places to visit near Byron Bay: Yamba (Turners Beach & Pippi Beach), Hastings Point Headland (in Hastings Point) and Tweed Regional Gallery & Margaret Olley Art Centre (in Murwillumbah). On the 8th (Fri), give your taste buds a day to remember with a local gastronomic tour. 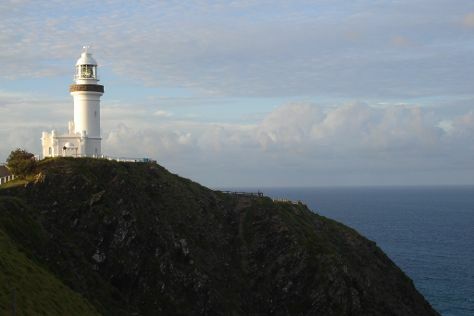 The adventure continues: enjoy the sea views from Cape Byron Lighthouse, view the masterpieces at Jules Hunt Studio Gallery, find your balance on the water with some of the best stand-up paddleboarding in the area, and get great views at Broken Head Nature Reserve. For more things to do, photos, and other tourist information, read our Byron Bay trip planner . London, UK to Byron Bay is an approximately 28-hour combination of flight and bus. Traveling from London to Byron Bay, you'll lose 10 hours due to the time zone difference. When traveling from London in November, plan for much warmer days and somewhat warmer nights in Byron Bay: temperatures range from 32°C by day to 18°C at night. Wrap up your sightseeing by early afternoon on the 9th (Sat) to allow time for the bus ride to Gold Coast. You'll find plenty of places to visit near Gold Coast: Brisbane (South Bank Parklands, Lone Pine Koala Sanctuary, & more). And it doesn't end there: observe the fascinating underwater world at Sea World Theme Park, enjoy breathtaking views from SkyPoint Observation Deck, enjoy the sand and surf at Surfers Paradise Beach, and get outside with Pelican Feeding. To find other places to visit, traveler tips, maps, and more tourist information, you can read our Gold Coast vacation maker app . You can take a bus from Byron Bay to Gold Coast in an hour. Alternatively, you can drive. In November, daily temperatures in Gold Coast can reach 30°C, while at night they dip to 20°C. Cap off your sightseeing on the 14th (Thu) early enough to travel to Sydney. Change things up with these side-trips from Sydney: The National Pass (in Blue Mountains National Park) and Wentworth Falls (in Katoomba). Spend the 21st (Thu) exploring nature at Sydney Harbour National Park. There's still lots to do: admire the natural beauty at Royal Botanic Garden Sydney, take a stroll through Darling Harbour, appreciate the extensive heritage of The Rocks, and enjoy the sand and surf at Manly Beach. For where to stay, maps, photos, and other tourist information, you can read our Sydney trip maker site . Fly from Gold Coast to Sydney in 3.5 hours. Alternatively, you can do a combination of train and flight; or drive. In November, daytime highs in Sydney are 29°C, while nighttime lows are 19°C. Wrap up your sightseeing on the 21st (Thu) early enough to travel to Bondi. Start off your visit on the 22nd (Fri): tour the pleasant surroundings at Bronte Beach, stroll the grounds of Waverley Cemetery, then see the interesting displays at Museum of Human Disease, and finally look for gifts at Aquabumps. Get ready for a full day of sightseeing on the 23rd (Sat): take some stellar pictures from North Bondi Lookout, steep yourself in history at Vaucluse House, contemplate the waterfront views at Parsley Bay Reserve, then make a trip to Macquarie Lighthouse, and finally kick back and relax at Tamarama Beach. To see other places to visit, photos, where to stay, and tourist information, refer to the Bondi trip planner. Bondi is just a stone's throw from Sydney. In November, daily temperatures in Bondi can reach 29°C, while at night they dip to 19°C. Finish your sightseeing early on the 23rd (Sat) so you can travel to Melbourne. Step out of Melbourne to go to Torquay and see The Great Ocean Road, which is approximately 1h 40 min away. Dedicate the 28th (Thu) to wine at some of the top wineries in the area. The adventure continues: take in nature's colorful creations at Royal Botanic Gardens, contemplate the long history of Old Melbourne Gaol, let your taste buds guide you at a local gastronomic tour, and don't miss a visit to Block Arcade. For ratings, reviews, other places to visit, and tourist information, refer to the Melbourne holiday planning website . Use the Route module to find suitable travel options from Bondi to Melbourne. Plan for slightly colder nights when traveling from Bondi in November since evenings lows in Melbourne dip to 11°C. On the 30th (Sat), you'll travel back home.